Mentor James Long and the interns at MacPherson’s College in Kansas, gathered around restored/rebuilt 1936 Indianapolis 500 winner. 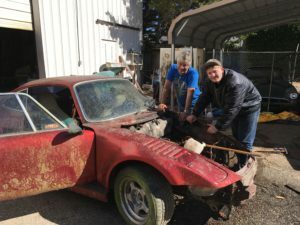 When public charter Bitney Prep High School rented several unused auto repair garages as classrooms, a unique partnership sprang up between our students and James Long, the classic race car restorer who shared the property. Students drifted towards the rusty Fords and Studebakers, the gleaming yellow hot rod, the 1956 Porsche cut in two. Collaboration followed – first, a one week course, then a semester elective. One intern signed up, then two. Always generous, James took a student on his annual road trip to the Indy 500, where they watched the action with the pit crews. With the LRNG Educator Innovator grant funding, additional support from regional auto supply stores, plus connections throughout the classic race car community, and our already active internship program, we built a program in which students rehab, remodel and sell donated cars, using the proceeds to fund expansion of existing classes, trips to automotive museums, restoration shops, technical colleges, junkyards, and, yes, old barns. Additionally, students in the program helped fix up a multi-passenger vans for our school, greatly increasing the number of annual Indy trip participants, and facilitating many more tours of colleges, non-profits and business sites, places for interns to discover their interests and passions. 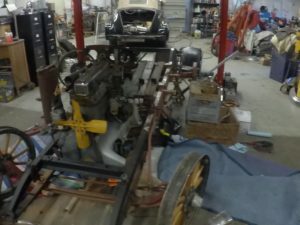 James and Brandon showcasing a car when it starts the restoration process. Like young people everywhere, Bitney’s students exist, to a more or less successful degree, within several spheres of influence, from the personal (close friends, family) to the global (celebrity culture, the news cycle); from the traditional (sports teams, driver’s license) to the newly arisen (suicide ‘fan’ clubs, Snapchat); from the foundational (gender, age) to the insubstantial (kitten videos, memes). In general, our small enrollment, tolerant staff and funky physical plant attract students who do not want to attend the comprehensive high school just five minutes away, or who have been less successful there. Some come to Bitney because poverty, or addiction, or educational disadvantages have interfered with their self-esteem. Others have deep questions about their gender or sexual identities, and feel more safe in smaller social fishpond. Still others are drawn to our individualized education programs, our environmental consciousness, or our innovative spirit. Whatever their circumstances, by creating a unique partnership with a gifted mentor, we sought most of all to connect our students to their own interests and passions, thus giving them the confidence to extend their sphere of influence into the broader world of neighbors, community, and global society with focused, dynamic energy and with genuine curiosity. The elective classes attracted every variety of students we had, but the internships tended to appeal to young men with unstable family circumstances. Two of our students were homeless for a time, sometimes couch surfing, sometimes staying with neighbors, sometimes asleep on the school bench when we arrived to start the day. Two others had absent fathers. In general, as you might expect, most were not academic stars. In fact, at least two were likely to drop out prior to our program. What did these gentlemen learn during their time in the restoration garage, and out on the open road? Relevance. Respect. Rigor. Like most well-crafted internships, having hands-on work assists students in integrating, shaping and connecting three spheres of influence. First, wrenching cars at school helps rebuild a faltering American tradition: hanging out with your dad (mostly) while he worked on the family wagon, or the mini-bike, or the old VW bug he planned to give you when you were ready. (We’re not sexist, but it is a fact, demographically and anecdotally, that our students are primarily raised by their mothers in single-parent households, and that overwork, social norms, and former notions about gender roles still mean many mothers do not find auto repair or engineering as fascinating as fathers. Though it is difficult to quantify, boys in particular seem to suffer from this loss of active fathers.) Young men and women* in auto restoration classes and internships have an opportunity to explore the often fractured father-child relationship, and to bring new tools into what is, for many, unfamiliar territory. Through our program, students learned how to handle and respect tools, how to take pride in craft, how to innovate with available materials, how to work side by side with focus, and how to persist, on hot and cold days, in uncomfortable positions, with bleeding knuckles, until the job is done. 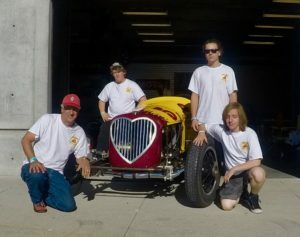 A total of 6 young men were able to travel to the Brickyard Invitational, a vintage race car showcase and demonstration race in Indianapolis during the summer. All of them were able to drive the restored 1936 Gilmore pictured in this post. 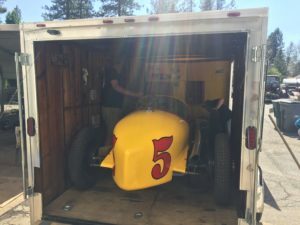 In addition, and perhaps more important, all were able to spend several days interacting with the biggest names in vintage racing and collecting, including Jay Leno, and a variety of famous drivers. 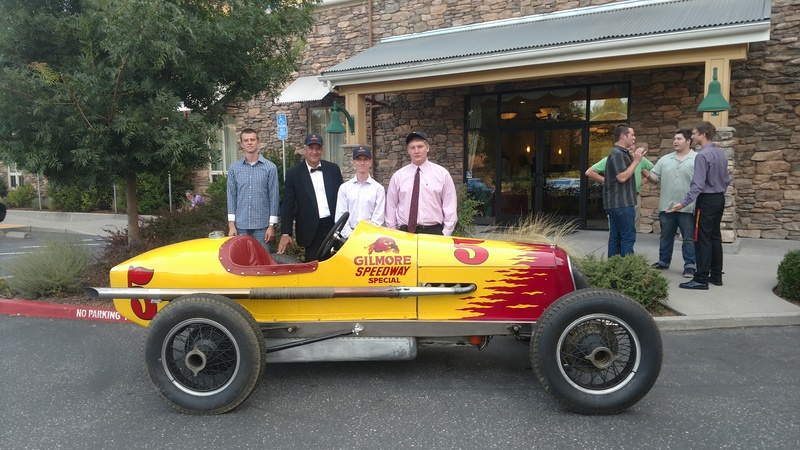 On the trips to Indianapolis, students towed a trailer they had turned into a mini-race car history museum, with classic and one of a kind photos, car parts, engines, as well as the race car they’d been working on. This trailer was then displayed, with students offering tours, at each of the official stops. 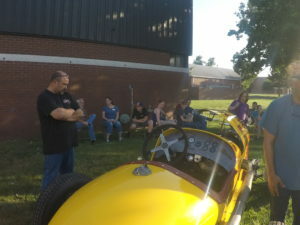 On each of the trips back to the Brickyard, students were able to visit McPherson College in McPherson, Kansas, the only college in the country offering a Bachelor’s degree in Auto Restoration. 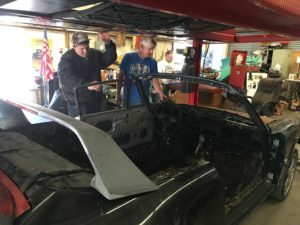 While there, students received tours of the extensive auto restoration facilities, spoke with professors, current students, and alumni, and got to show off their own handiwork. For many of these students, McPherson, was the only 4 year college they’d even considered. Some of the dramatic landscape interns witnessed on their trips back to Indy. 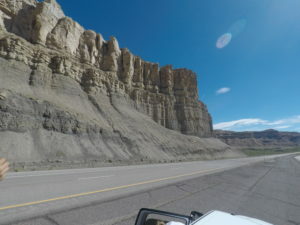 Students on these trips were able to explore Yellowstone National Park, the Great Salt Flats in Utah, and other areas of historic and environmental significance. Interns who’d participated in the previous trip acted as teacher’s assistants for the following year’s elective classes, and in many cases mentored new interns. 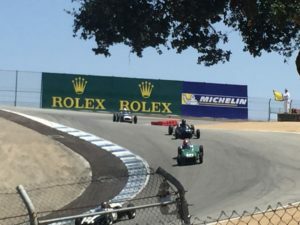 The race at Laguna Seca, part of the Pebble Beach trip. 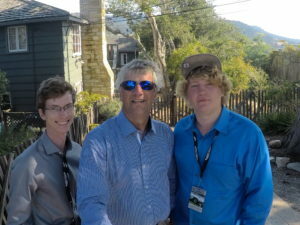 Students were also able to visit private restoration and collector’s garages, including Jay Leno’s collection, and to attend the Pebble Beach Concours d’Elegance, the West Coast’s premier collectable, rare and expensive auto show. 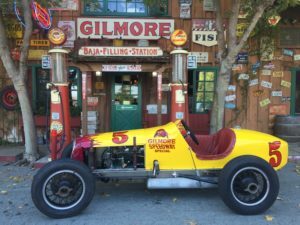 Some of the interns were able to go to the The Race of Gentlemen in Pismo Beach, a vintage reenactment event in which drivers and crew are obligated to wear period clothing. Again, these opportunities opened student’s eyes both to the history and the passion displayed by so many interesting people. Top interns in the program purchased and restored cars, or helped restore others, which were then sold to help raise sustaining funds for the program. While the program was not specifically an auto mechanics class, students greatly increased their knowledge of and facility with all aspects of automotive maintenance and repair. Three students were able to attend a talk and award ceremony to celebrate Indy 500 winner Alexander Rossi (a native to our area). One student received an award at this event, and went on to study automotive design and engineering at Western Washington university. It is difficult with any population of students to attain perfect alignment with the lofty goals of us curriculum and program designers, no matter how special and fancy we make the incentives. With our students group, it was most difficult to get them to write, or otherwise record their experiences. We tried several techniques( in addition to threatening them with every possible negative educational option, which they vaguely heard and responded to). These included using a new GoPro (part of our grant expenditures) to document their journeys and their progress, starting a Facebook page and Twitter account, creating a website, and actual physical writing assignments. While the students did use the GoPro extensively, the quality of the pictures and video rendered the majority of these documents close to useless. The Facebook page, and especially the Twitter account, suffered from neglect. Interestingly, the website blog posts provided the most successful regular writing mechanism. Something about seeing one’s words more or less immediately available on a site which was open to the entire world inspired a sort of celebrity pride, and our most reluctant writer took the project on successfully. As mentioned above, our participants predominantly arose from pretty dysfunctional households. This meant we had almost no parent support, either financially or practically. In addition, with students moving from household to household, or occasionally sleeping in cars, it was difficult to make academic headway, a component of the program. Finally, without meaning to create stereotypes, folks in the auto industries sometimes excel in hands on activities but find sit down classroom work considerably more difficult. Between losing students and having to bend over backwards, the effort required to achieve ‘school success’ in parallel to project success was considerable – more than we planned for. While Bitney High School seemed initially very enthusiastic about the program, other considerations arose which made forward momentum harder than we thought. This included a certain possessiveness around the grant funding by the school, which showed up as reluctance to pay for the specified activities or costs, and an on-going desire on the part of the school to ‘own’ the tools and supplies used in the automotive restoration projects. In addition, it was the last year of the director of the school, which meant he lost interest and thus active support, and the first year of the business manager, which means she had no experience in managing grant funding. These factors created barriers which had not been anticipated, and which frustrated all of the participants, weighing down a bit on the positives. One of the biggest struggles we encountered had to do with schedule changes at the school which radically reduced the amount of time available for the teacher to coordinate with the mentor and participants. Given more time to dedicate to the problem, we would have had more specific academic crossover to the garage – class-type work on automotive history, reading articles and magazines related to the races, colleges, and collections, specific assistance with the TAs. In addition, the academic coordinator ran into personal problems – a very sick son and subsequent inability to complete the school year – which essentially left the project hanging without a manager. While we did not achieve all of our goals, we feel like the project was a success, in particular for the two students who were periodically homeless. Both joined as high school juniors, and, based on missing credits and general malaise, both were unlikely to graduate, or even remain in school. However, both did graduate, and in their final presentations, both clearly spoke to the program and the mentor as the one reason they remained in school. One of these students entered the program with a full year’s worth of missing credits, and had previously indicated his only life skill was “the ability to carry heavy objects.” After enrolling in this program, he once walked 9 miles to school at night and slept on the front bench in order to be present for this internship when his host family was in chaos and couldn’t provide a ride. He is now enrolled at the local community college taking classes in welding, fire technology, auto mechanics and criminal justice, having realized that his career choices are vast and varied. Even though we had hoped to involve more students, the degree to which we positively impacted this one student shines unforgettably for all involved. If we were to do it all over again, here are some changes that might make it more successful. Broaden the team outside of the principals. In our case, that would’ve involved enrolling auto parts stores, local mechanics, the ROP community, car clubs and others from the very beginning, thus assuring we spent less time ‘selling’ involvement when the program was already underway. Clarify from the beginning the precise nature of the financial oversight provided by all parties, as well as the anticipated expenses and deadlines. It is easy to forget how bureaucratic and unwieldy institutions become when a little money starts flowing. Reserve specific time (20% full time equivalent) for the educator running the program to work with all participants so that the program solidifies around a set of objectives which can easily please parents, the school and the bean counters. An unusual program, especially when it is brand new, requires a LOT of creating on the go, and if the teacher doesn’t have enough time set aside, important bits drop out. Consider the exact nature of the to-be-demonstrated academic requirements, especially the writing, and make sure everyone is very clear from the beginning. These sorts of things, operating outside of the school for the most part, can spin out of focus a bit (not necessarily a bad thing) and need a pretty solid contract to revisit from time to time. Bite off what you can chew. We attempted to accomplish more than we could reasonably, even had all of the other factors not intervened, and in so doing learned that a tight, quality ‘pilot’ program is better than a broader splashier dream. Include photography, videography, editing and website basics in the academic preparation and on-going instructional component of the program no matter what program you’re designing. First off, these are very valuable real world skills, and second, even a small hurdle in the path of explanation and documentation can create a large headache. Don’t assume students in this generation are born with all the technical skills they’ll need. Finally, relax. Enjoy. Have fun. Hitting the high points is better than hitting the agenda points. All experiences will have some impact on the lives and thoughts of students; the ones with more juice are likely to be remembered and acted upon for longer. This one’s coming up next – note the wooden wheels!